The dust has settled. The finals are set. The World Junior Championship will come to an end on Saturday, and all the drama will be over. It’s been a terrific tournament so far, with huge upsets, surprising superstars and prized prospects making a name for themselves. Now, the United States and Finland, the two teams that have persevered to the end, will battle for the gold medal. Let’s preview the two games on Saturday’s agenda. Before diving into the matchups, let’s give an appropriate shout out to Kazakhstan, who held off Denmark for the second straight game to ensure that they’ll be moving on to next year’s tournament. Denmark will be relegated for the first time in five years, while a German team that will feature 2018 first-round pick Dominik Bokk will move up to the main tournament. Team Kazakhstan defeated Team Denmark 4-3 and 4-0 in the relegation round to keep their spot in the top division for the 2020 IIHF World Junior Championships. In the end, Kazakhstan made it look fairly easy with a 4-0 victory. It marked the fifth time in the tournament that Denmark had been held goalless. Sayan Daniyar and Artur Gatiyatov remained two of Kazakhstan’s best players, as the pair combined for three goals and an assist. Denmark was not up to the challenge this year, and the scrappy underdog team punched their ticket to next year’s tournament in the Czech Republic. Russia fell to the United States in a thrilling contest that left them heartbroken. Though they outshot the Americans heavily, they could not score a tying goal, and missed out on the gold medal game. They’ll need a victory over Switzerland to not leave the tournament empty-handed. Team captain Klim Kostin has been at the center of some controversy in the last few days of the tournament after he made comments about Team Canada that were met with derision from the host nation’s fans. He remains an emotional leader for the team, and will be critical to their success in the bronze medal game. The Swiss had a magical run, but couldn’t stand up to the offensive onslaught of a Finnish team that caught fire. Goaltender Luca Hollenstein allowed four goals in the first eight minutes of the game before being pulled, which was a disappointing outcome after his dominating shutout of Sweden. Philipp Kurashev remains the best offensive threat on the Swiss team, as he scored the team’s only goal against Finland. He is now tied for the tournament lead in goals with six, having had one of the more impressive performances. Russia will enter the game as heavy favorites, but Switzerland has slain dragons before. Will the Russians ride the roller coaster of emotion through to a bronze medal, or will the Swiss conclude their best WJC performance ever with a third-place finish? The United States team has been through a lot this tournament. They had an incredible comeback against the Swedish team fall short in overtime and they lost one of their best players, Jack Hughes, to injury for most of the preliminary round. And yet they find themselves in the gold medal game, one win away from collecting their fourth such medal this decade. But the Finnish squad will be a dangerous opponent. They fired on all cylinders against Switzerland, and may be the hotter team coming in. 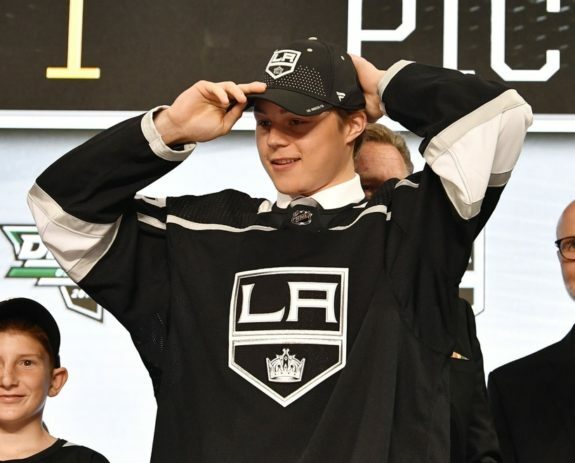 Captain Aarne Talvitie scored two goals, while fellow forward Rasmus Kupari, whom the Los Angeles Kings selected 20th overall at the 2018 Entry Draft, collected his first three points of the tournament. The Finns are loaded with talent upfront, with Kaapo Kakko, Jesse Ylonen and Eeli Tolvanen joining Talvitie and Kupari. They also have a stellar goaltender in Ukko-Pekka Luukkonen, who has been strong the entire week. If Finland has a shortcoming, it’s on defense. While Henri Jokiharju is the only player in the tournament who’s played the whole season in the NHL, he does not have a ton of help on the blue line. That could be a problem, as, unsurprisingly, the U.S. has a lot of forward talent, too. Hughes may have stolen the headlines coming into British Columbia, but he’s been outshined by Ryan Poehling and Tyler Madden, who played huge roles in his absence. They’ve also had contributions from Joel Farabee, Jason Robertson and Oliver Wahlstrom, who scored the first goal in the game against Russia while Sasha Chmelevski scored the game-winner. The Americans’ defense is led by captain Mikey Anderson and Hughes’ brother, Quinn, and has other dynamic players including K’Andre Miller. Their goaltending has been strong as well, though the team has, perhaps surprisingly, leaned on former seventh-round pick Cayden Primeau instead of presumptive 2019 first-round pick Spencer Knight. The game could be decided by which of Luukkonen or Primeau performs better, and it’ll be a tough test as both have been rock solid throughout the week. 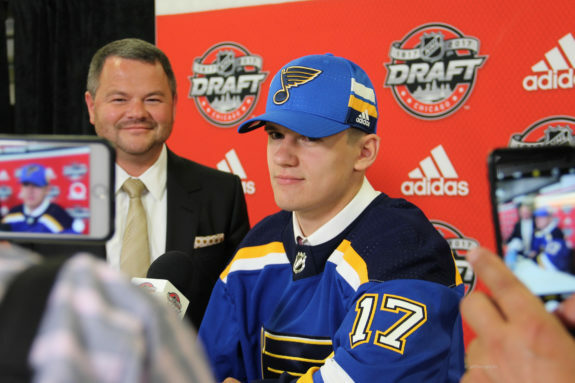 The exciting showdown features the likely first and second pick of the 2019 Entry Draft in Hughes and Kakko. Could one of them cement their place as number one by taking over this game and carrying his team to victory? What a tournament the 2019 WJC has been. Canada failed to medal in a tournament it hosted for the first time in history. The Swedes were bounced in the quarterfinals for the first time since 2006. Switzerland made it as far as they ever have and underdog Kazakhstan fought back to avoid elimination in the relegation series. These are the stories that make the WJC so special. For some of these kids, this tournament will be the highlight of their hockey careers. For others, it’s just the beginning of a legendary NHL tenure. But this week, on the ice in British Columbia, they were all equals. From the flashiest prospect on Team Canada to the grittiest nobody on Team Kazakhstan, from players like Jack Hughes and Alexis Lafreinère, who are expected to go first overall in the next two NHL drafts, to players whose names we’ll forget and who have no draft expectations, all of them will share the memories of this tournament for years to come, and each and every one of them can say they did their country proud at the 2019 WJC.